This section of the website features observations about the Thoroughbred racing and breeding industry written by Thoroughbred Information Agency (TIA) and www.thoroughbredinfo.com President Lisa Groothedde and Vice President Rudi Groothedde. Blog entries dated prior to November 1, 2008 were written by TIA founder and former owner Don Engel, who established this website in 1997. Do you have an opinion to share about this blog, or any other racing-related topic? We want to hear from you! Post your comments on our Facebook page, or join the discussion with us on Twitter. Well, today is the day. The winners of the 2014 Eclipse Awards will be announced this evening in Florida. Best of luck to all of the contenders. Here at Thoroughbred Information Agency, we are uniquely privileged with two Eclipse Awards votes from a husband-and-wife management team consisting of two former editors of national award-winning magazines: President Lisa Groothedde, former editor of “The Texas Thoroughbred,” and Vice President Rudi Groothedde, former editor of “California Thoroughbred.” As longtime members of the National Turf Writers and Broadcasters (NTWAB), we take our Eclipse voting responsibilities very seriously. Although we don’t always agree on our choices, we are each lucky to have a counterpart who can read between the past performance lines and bring a different perspective to the discussion, allowing us to take a broadened view of each award contender (often accompanied by lively debate). It is in that spirit that we have been publishing our individual votes for the 2014 Eclipse Awards, focusing on a category or two each day, since this year’s finalists were announced on January 7. In addition to divulging our choices and the rationale behind our selections here on our website, we’ve invited you to share your opinions about these categories as well. Today, we reveal our votes for the biggest honor of all: Horse of the Year. Agree? Disagree? Let us know on our Facebook and Twitter pages. Lisa: In 2014, California Chrome was not only the Horse of the Year, he was the Story of the Year. He put together a sporting, nationwide campaign, won four Grade 1 races on two surfaces and came within two lengths of capturing the elusive Triple Crown. Other runners have been named Horse of the Year for doing far less. Frankly, I think Shared Belief is just as talented, and would love to have seen him rewarded for his grand season with a Horse of the Year finalist position, but I understand why other voters could not find room for him on their ballots. The good news for racing fans is that all six of our 2014 superstars — California Chrome, Shared Belief, Bayern, Main Sequence, Wise Dan and Untapable — are scheduled to return to the races in 2015. Let the games begin. It is in that spirit that we are publishing our individual votes for the 2014 Eclipse Awards. This year’s finalists were announced on January 7; the winners will be crowned on January 17. In the days leading up to the awards dinner, we will divulge our choices and the rationale behind our selections here on our website. We invite you to share your opinions about these categories as well. Today, we reveal our votes for the Outstanding Jockey and Outstanding Apprentice Jockey divisions. Agree? Disagree? Let us know on our Facebook and Twitter pages. Rudi: As the rider of Eclipse finalists American Pharoah, California Chrome and Take Charge Brandi in their most important races of the year, Victor Espinoza should have shaded Joel Rosario to stand alongside Javier Castellano and John Velazquez, in my opinion. Lisa: This was a pretty cut-and-dry vote for me. Castellano dominated by earnings and ranked second by total wins last year, Velazquez tallied the most Grade 1 wins and Rosario ranked second by earnings and Grade 1 wins. Espinoza receives the honorary “Matthew McConaughey” award from me for enjoying a career renaissance year in 2014. Rudi: I find this the least interesting category among the Eclipse Awards every year, but thought that Drayden Van Dyke and Taylor Rice should have been joined by Trevor McCarthy, not Angel Cruz, as the finalists, primarily based on the phenomenal numbers McCarthy posted during his abbreviated apprentice campaign that ran through less than four months of the year. Lisa: I have not cast a vote in the antiquated Apprentice Jockey category in several years. Congratulations, however, to likely winner Mr. Van Dyke, who has proven he can hold his own in our salty Southern California jockey colony. Today, we reveal our votes for the Outstanding Trainer division. Agree? Disagree? Let us know on our Facebook and Twitter pages. Rudi: Based on the cold, hard statistics, Todd Pletcher and Chad Brown are deserving finalists this year, but I felt that Art Sherman’s handling of California Chrome, and the media throng that surrounded him, should have been enough to get an acknowledgement over finalist Bob Baffert. Lisa: In the 2014 Cinderella story of California Chrome, Art Sherman was Prince Charming. Not only did this congenial hardboot become, at 77, the oldest trainer in history to win the Kentucky Derby (G1), he did so with a California-bred underdog who lived and trained at Los Alamitos, a humble racetrack that only this year was expanded to accommodate Thoroughbred racing. On top of that, he managed the worldwide media and fan attention with grace and courtesy, never losing his cool or his modest smile even through some very public foibles by the Derby winner’s owners. Unfortunately, this particular fairy tale ended when the majority of Eclipse voters were too myopic to consider Art’s masterful handling of his once-in-a-lifetime horse, ignoring him in favor of the usual big-name, big-budget, big barns. It is a damn shame. Today, we reveal our votes for the Outstanding Breeder and Outstanding Owner divisions. Agree? Disagree? Let us know on our Facebook and Twitter pages. Rudi: I am sad for the sport of horse racing because Perry Martin and Steve Coburn are not finalists in this category. What more did they have to do to stand alongside Adena Springs and the popular Ken and Sarah Ramsey? California Chrome is the first horse they ever bred. They did so at a bargain-basement price. And, most importantly, he became the first horse bred in California to win the incomparable Kentucky Derby (G1) since 1962. I just don’t get it. Lisa: I’m afraid it’s what they did do that might have kept them shut out of this category. Mr. Coburn’s bitter, anti-establishment rant in the most public of all venues — televised to a worldwide audience mere moments after his extremely popular horse failed at Belmont Park in his Triple Crown attempt last June, and Mr. Martin’s subsequent barbs against turf writers and Del Mar management when his horse was asked to parade at the track the following month were apparently not easily forgotten, nor forgiven by the majority of Eclipse Awards voters. That being said, Flaxman Holdings gets my top vote in this category for producing Breeders’ Cup Turf (G1) winner and Horse of the Year finalist Main Sequence and Breeders’ Cup Mile (G1) winner Karakontie (Jpn). Quite a feat! Rudi: No complaining here, as my three top choices make up the trio of Eclipse finalists. My choice for third was close, so I’d just like to say that I felt Flaxman Holdings deserved a dead-heat in this position for campaigning two 2014 Breeders’ Cup winners. Lisa: Every stallion should get the support that the Ramseys have given their homebred Eclipse champion Kitten’s Joy since he was retired to the breeding shed in 2005. They filled his initial books with well-bred racemares claimed off the track just for him, rubber-stamped his foals with their sire’s name to boost recognition, sold some at auction and kept many to race themselves. Fast forward 10 years: Kitten’s Joy commands a $100,000 fee as North America’s leading turf sire of 2013-2014, and the Ramseys absolutely dominate the owners’ standings by earnings (more than $10 million) while collecting 10 graded stakes trophies in 2014. Bravo! Today, we reveal our votes for the Champion Turf Horse divisions. Agree? Disagree? Let us know on our Facebook and Twitter pages. Rudi: This was the easiest category for me, and I hope all the other voters, to choose the finalists. Main Sequence from Wise Dan from Karakontie; done. Lisa: There was not a lot of variety in Main Sequence’s 2014 campaign: four starts on the grass at 11 and 12 furlongs. But those starts came in Grade 1 company on four different courses, and included his victory over a Breeders’ Cup Turf (G1) field that featured second-place finisher Flintshire (GB), the Prix de l’Arc de Triomphe (G1) runner-up and subsequent winner of the Hong Kong Vase (G1). It’s too bad Wise Dan was unable to return to Santa Anita for a three-peat attempt in the Breeders’ Cup Mile (G1); a win by him would have matched Main Sequence’s four Grade 1 trophies on the year, thereby changing the complexion of the entire Eclipse Awards voting process and Horse of the Year debate. Rudi: I knew things were getting too good to be true, so back to a bit of contention. Granted, finalist Stephanie’s Kitten did make six starts, all in Grade 1 company, but she only won one of them. Meanwhile, Coffee Clique was unbeaten in a trio of starts in three different states, including at the Grade 1 and Grade 2 levels, while also handily defeating Stephanie’s Kitten in the Just a Game Stakes (G1). Lisa: What a drab division this turned out to be last year. The likely champion, Dayatthespa, only had one other Grade 1 title to pair with her Breeders’ Cup Filly & Mare Turf (G1) victory. I gave my remaining two votes to Keeneland Grade 1 turf winner Crown Queen and Belmont Grade 1 grass winner Coffee Clique, each of whom also scored Grade 2 victories in 2014. Today, we reveal our votes for the Champion Sprinter divisions. Agree? Disagree? Let us know on our Facebook and Twitter pages. Rudi: “Hurrah” to those who voted for Work All Week and Private Zone in this category, but “Boo” to those who favored Goldencents over Palace. The latter won two Grade 1s and a Grade 2 at six and seven furlongs on the dirt in New York, while the former was victorious in California in a seven-furlong Grade 2 on the all-weather and the Breeders’ Cup Dirt Mile (G1), which is a two-turn race that I don’t consider a sprint. Lisa: A mile is a mile is a mile, whether it is one turn, two turns or three turns (RIP, Fairplex Park). I don’t understand the constant confusion over this basic dimensional fact. Anything carded at less than a mile is a sprint; anything carded at a mile or more gets a line drawn through it in my Eclipse Awards past performance guide. Back to this year’s discussion. While it wasn’t a glamorous campaign to determine a champion, Work All Week did win four stakes races at true sprint distances, including the defining Breeders’ Cup Sprint (G1), in which he soundly defeated the 2014 dual Grade 1 winners Palace and Private Zone, who each deserved to be finalists along with him. Rudi: Whew, finally a division where I believe everyone is on the same page. In order of merit at pure sprint distances, Judy the Beauty, Sweet Reason and Artemis Agrotera are the “no-brainer” finalists. Lisa: No arguments from me on this one either, except to mention that I was disappointed that Grade 1 winners Artemis Agrotera and Sweet Reason flopped so badly in the Breeders’ Cup Filly & Mare Sprint (G1), depriving fans of the marquee throwdown that I was expecting. Today, we reveal our votes for the Champion Older Horse divisions. Agree? Disagree? Let us know on our Facebook and Twitter pages. Rudi: I am 100% happy with the three finalists, who match my ballot, but it is a sad reflection of this division that only one of them is a dirt runner and that they had a combined 13 starts between them from individual campaigns of less than six months each. Lisa: I agree; not exactly an older horse division for the recordbooks. Main Sequence was perfect in all four of his starts in this country, each in Grade 1 company on the grass. With four graded dirt wins before he was sent to the sidelines in late summer, Palace Malice was the best older main-track competitor. And although it was wonderful to watch two-time reigning Horse of the Year Wise Dan make his successful comeback following colic surgery, I’m giving my third slot to repeat Breeders’ Cup Dirt Mile (G1) winner Goldencents, who was never worse than second in five starts at the highest of levels on both dirt and all-weather surfaces. Rudi: Close Hatches and Dayatthespa are deserved finalists, but I am outraged that Judy the Beauty is not a finalist in this category. It is disappointing that this Breeders’ Cup Filly & Mare Sprint (G1) winner on the dirt in California and Grade 1 winner on the all-weather in Kentucky, who scored additional Grade 3 wins on both these surfaces in the Golden State, was shut out by Don’t Tell Sophia, whose only graded stakes victory of the year came against a mere five opponents on the dirt in Kentucky. Lisa: Close Hatches started the year with a real bang: victories in three Grade 1 events and a Grade 2 test at three different tracks. Although she concluded her career with two subsequent, unexplained losses, no other distaffer came close to her, record-wise, in 2014. The Breeders’ Cup tallies by sprint specialist Judy the Beauty and turf runner Dayatthespa gave them the edge for me in this muddled category. Today, we reveal our votes for the Champion 3-Year-Old divisions. Agree? Disagree? Let us know on our Facebook and Twitter pages. Rudi: The trio of California Chrome, Shared Belief and Bayern are the obvious finalists for this highly sought-after trophy. But, for me, I would love to know what could have been if reigning Eclipse champion Shared Belief had not been so unlucky in his only loss of the year in the Breeders’ Cup Classic (G1). However, I do not base my votes on “what-ifs,” so California Chrome deserves this championship for his exemplary record in 2014. Lisa: Unlucky? Shared Belief was robbed, pure and simple. Can we just turn back the calendar by three months and re-run the Breeders’ Cup Classic as a clean race, please? That race was so compromised that I had no choice but to draw a line through it. Sorry, Bayern. Shared Belief did everything asked of him last year, but California Chrome did more. Shared Belief, a three-time Grade 1 winner in 2014, excelled on two surfaces and defeated his elders twice, but only traveled within his home state to do so; four-time Grade 1 winner California Chrome captured two-thirds of the Triple Crown and also excelled on two surfaces while handling a cross-country schedule. Advantage here goes to the crowd-charming chestnut. Rudi: Untapable is the clear stand-out in this division, with no losses against her own gender last year as the undisputed Kentucky Oaks (G1) and Breeders’ Cup Distaff (G1) winner. Stopchargingmaria is also a worthy finalist, but I want an inquiry into how Sweet Reason, a dual Grade 1 winner on the dirt in New York, got more votes than Room Service, a Grade 1 winner both on turf in California and all-weather in Kentucky and a Grade 3 winner on the grass in Florida. Lisa: Any arguments for or against the finalists in this category are pointless, since Untapable is the closest we have to a sure thing at the Eclipse Awards ceremony this year. Her four Grade 1 victories — in four different states — were accomplished by a dominating total win margin of 16 lengths. Nice filly. Since you asked about Sweet Reason, though, I will just point out that she finished closer to Untapable than any other female last year, losing the Grade 1 Cotillion by a mere length. Late nights and early mornings. Tight deadlines, writer’s block and low pay. The death of print and the growing infringement of mistake-riddled “new media” and untrained bloggers. Being a professional journalist in the Thoroughbred racing industry is not as glamorous a career as it used to be, back in those days captured on black-and-white film, when men in hats hacked away furiously at their typewriters in crowded racetrack press boxes and clamored around the likes of Tom Smith and “Sunny Jim” Fitzsimmons for updates on their charges on behalf of an enraptured newspaper, then radio, then television, audience. But that was yesteryear. Oh, sure, there are still some perks to be enjoyed in the scaled-down world of horse racing journalism in the modern era, such as being on the track with camera in hand just yards away from the finish of the Kentucky Derby (G1), and having behind-the-scenes access to the colorful characters and amazing athletes who populate our intoxicating sport. But perhaps the highest honor of being a turf writer today is the ability to cast a vote in the annual Eclipse Awards, our industry’s version of the Academy Awards. Today, we reveal our votes for the Champion 2-Year-Old divisions. Agree? Disagree? Let us know on our Facebook and Twitter pages. Rudi: Although two-time Grade 1 winner American Pharoah and Breeders’ Cup Juvenile (G1) winner Texas Red were my slam-dunk choices as finalists, I am comfortable with Breeders’ Cup Juvenile Turf (G1) winner Hootenanny being chosen by the majority of Eclipse Awards voters as the other finalist over my third pick, Carpe Diem, who I am confident will “Seize the Day” in 2015. Lisa: Texas Red’s 6 1/2-length, widening victory over previously undefeated Grade 1 winner Carpe Diem, who, to me, is the most exciting colt to emerge from the 2012 crop to date, was enough to tilt my vote in his favor over American Pharoah, whose ill-timed injury kept him from competing in the biggest dance of the year. Rudi: I’m happy with the finalists Take Charge Brandi and Lady Eli, but I’m disappointed that Condo Commando, a Grade 1, Grade 2 and maiden winner on the dirt in New York, got the nod over the more versatile Sunset Glow, a Grade 1 and Grade 2 winner on an all-weather surface in California and a Group 3 runner-up and maiden winner on the turf in England and New York, respectively. Lisa: I’m not going to waste effort arguing the merits of this year’s runners-up, except to say that I do not consider starts outside of North America for any Eclipse nominee. For me, this award is all about Take Charge Brandi and the masterful, late-season campaign she accomplished under Racing Hall of Fame trainer D. Wayne Lukas. The 61-1 longshot Breeders’ Cup Juvenile Fillies (G1) winner earned my top vote after her dominant follow-up victory three weeks later in the Grade 3 Delta Downs Princess Stakes; her subsequent victory in the Grade 1 Starlet Stakes — her third graded stakes tally in just six weeks — was just icing on the cake. This year’s race for win, place and show positions on California’s overall sire list promises to come right down to the wire, with the diverse trio of Lucky Pulpit, Tribal Rule and Bluegrass Cat all still in the running for any one of these three positions with only two weeks remaining on the 2014 racing calendar. At the conclusion of this three-way battle on December 31, a new leading sire will be crowned in the Golden State for the first time in seven years, following a reign at the top from 2008 through 2013 by Unusual Heat, the venerable 24-year-old son of Nureyev who is guaranteed fourth place in the 2014 standings. Based on official Jockey Club statistics through December 15, Lucky Pulpit currently ranks first with $5,120,891 in cumulative progeny earnings for this year. Tribal Rule and Bluegrass Cat rank second and third with respective totals of $4,981,614 and $4,794,818. A 13-year-old resident of Harris Farms, Lucky Pulpit has recorded 32 winners from 71 starters in 2014, led by his Eclipse Horse of the Year candidate California Chrome, whose crowd-pleasing victories in this year’s Kentucky Derby (G1), Preakness Stakes (G1), Santa Anita Derby (G1), Hollywood Derby (G1) and two additional stakes races contributed an astounding $4,007,800 to his sire’s coffers. The late Storm Cat stallion Tribal Rule, who died at the age of 18 at Ballena Vista Farm last May, is represented by a state-best seven stakes winners this year. From his 184 starters in 2014, 111 have reached the winner’s circle; chief among these is the sophomore gelding Red Outlaw, winner of four consecutive stakes races in Southern California from February through October and a year-to-date earner of $320,900. Recently relocated from New York to stand at Ballena Vista is 11-year-old Bluegrass Cat, a Grade 1 winner by Storm Cat who will cover his first book of California mares in 2015. This year, half of his 250 starters have won at least one race, and five were victorious in stakes events. His top moneymaker of 2014, with a $140,672 bankroll, is Lieutenant Seany O. Every day for the next month, from October 1 through November 1, we will profile one of the top-tier horses who are currently living, training and racing at Santa Anita Park as they make their final preparations for the 31st annual Breeders’ Cup World Championships — the 13-race, $24.5 million extravaganza that will be hosted at the Arcadia track for a history-making third consecutive year on Friday, October 31 and Saturday, November 1. On hand at Santa Anita to capture these images for us again this year is our Chief Photographer, Marcie Heacox, whose lenses always catch the most beautiful and interesting angles of our sport and the four-legged athletes we all admire. To enjoy the “2014 Breeders’ Cup Close-Up” feature, simply visit our homepage every day over the next month and either click on the current date under “The Latest Showcase News” or scroll down the page to view the newest photo. We will also post the photos each day on our Facebook and Twitter pages. We encourage you to comment and share these images via social media with current and potential horse racing fans as the countdown to the 2014 Breeders’ Cup continues! With the exception of just a few categories, I don’t expect many surprises when the envelopes are opened this evening to reveal the 2013 Eclipse Award winners. It was a fairly formful year, and one in which the voting guide I received as a member of the National Turf Writers and Broadcasters was relatively light, compared to recent years. After reviewing the past performances, it became clear that racing has yet to find another superstar the likes of Zenyatta, Rachel Alexandra or, heck, even a Big Brown or a Curlin. In fact, only five North American starters managed to win more than two Grade 1 races each from January 1 through December 31, 2013. Yikes. The fact that these five starters were a trio of 3-year-old fillies and a pair of 6-year-old geldings is further evidence that the breeding industry continues to beckon our most promising young males to the breeding shed prematurely, either with injuries (both legitimate and vague) or with lucrative stud deals that far outweigh their potential earnings on the racetrack. But that is a conversation for another day. Colt, filly, gelding or mare, good luck to this year’s finalists. They represent the best of what we do have, and they deserve congratulations for their accomplishments. The 2013 Eclipse Award winners will be announced this evening, with a live broadcast of the awards ceremony at Gulfstream Park starting at 4:30 p.m. Pacific on HRTV. Below are my personal selections for this year’s honors, as submitted on my official voting ballot. The undefeated California 2-year-old had the best record of his generation last year. But will the voters punish him for being a Breeders’ Cup no-show? That questionable Breeders’ Cup Juvenile Fillies (G1) disqualification in Ria Antonia’s favor still stings. With any luck, the more accomplished She’s a Tiger will get her revenge tonight. Will Take Charge put together an excellent end-of-year campaign, and is training to come back for more in 2014. Hats off to his connections! This vote should be the closest we have to a nail-biter this year. I’m hoping other voters will recognize that Beholder has the edge in head-to-head match-ups with Princess of Sylmar, and an emphatic Breeders’ Cup Distaff (G1) win to put her over the top of her very worthy rival. Where have all of our older males gone? Oh well. Wise Dan continues to be “The Man.” Keep on keepin’ on, Dan. It wasn’t as pretty as her 2011 or 2012 Eclipse Award-winning campaigns, but Royal Delta did just enough last year to three-peat. Thank you, Benjamin Leon, for keeping this very gifted – and very expensive – mare in training as a 5-year-old! While it’s always a treat to see a California-bred listed among the Eclipse Award finalists, this year we are left to sadly wonder what might have been. An uninspiring division this year, truth be told. My top two from my 2012 ballot repeat again here. The reigning Horse of the Year really didn’t have much competition in this category last year, with his six wins in six grass starts, all in Grade 1 or Grade 2 company, and at five different racetracks around the U.S. and Canada. With two Grade 1 wins in her only two starts on American sod, the British filly deserves top honors here. The Pletcher train keeps rolling. In 2013, he led all North American trainers by earnings and graded stakes victories – and the competition wasn’t even close. It was awfully hard to leave Joel Rosario off this list. He enjoyed several career highs last year, including wins in the Kentucky Derby (G1) and Dubai World Cup (G1) and even a Group 2 win at Royal Ascot, but he was forced to the sidelines in August with a broken foot. In his absence, Castellano barreled his way to the top by setting an industry record for annual mount earnings, and ranking first in number of wins by a significant margin at year’s end. Not sure why this award is still relevant. Why not an Eclipse Award for best assistant trainer, while we’re at it? The Ramseys led all North American Thoroughbred owners by earnings and graded stakes wins last year, making the Kentucky couple the surest bet among all Eclipse Award finalists tonight. Everywhere you turned this year, it was “Kitten” this, or “Kitten’s” that in the entries and, more importantly, in the winner’s circle. Ken Ramsey sure knows how to promote and support a stallion. Well played, sir. No fireworks here, just some throwbacks to days gone by, when the best handicap horses made more than just a few headline-grabbing starts to earn their end-of-year trophies. Surprisingly, the royally bred 3-year-old colt had the most 2013 outings among these three, with 11. But he’ll have to settle for an honorable mention in the ultimate category this year, as Wise Dan looks to receive his second consecutive Eclipse Award as North America’s top racehorse. The day has finally, sadly, arrived. After 75 years of historic racing, and several years of rumors, doubts and delays, Hollywood Park begins its inescapable march toward oblivion today, as the Southern California landmark opens its 2013 Autumn Meet — the final season of racing before the track’s looming date with the wrecking ball in 2014, which will eventually make way for commercial and residential development on the storied property. “The Track of Lakes and Flowers,” which hosted Seabiscuit’s victory in the inaugural 1938 Hollywood Gold Cup, which attracted more than 64,000 racing fans to the sport’s first Breeders’ Cup in 1984 and which staged the 2010 retirement party for racing’s most popular modern-day heroine, backside resident Zenyatta, will close the curtains for good at the conclusion of its current meet, on December 22. Unfortunately, it seems as if Hollywood Park has chosen to go out with a whimper, instead of a bang. Promotion of the final meet has been minimal, and the track’s Twitter account has not been updated with any news since July 22. More importantly, no official announcement has been made from Hollywood Park executives about the fate of the track’s iconic statues or possible reinterment plans for the beloved racehorses of yesteryear who are buried on-site, including Native Diver and Landaluce. Although it is a bittersweet undertaking, we have decided to memorialize Hollywood Park in our own way, by dedicating our popular homepage “Photo of the Week” feature to this soon-to-be-demolished racetrack. For the next six weeks, from today through December 18, we will feature a unique look at the facility’s well-known sights and the hidden treasures of its grandstand and beautiful, doomed grounds through the lens of photographer Marcie Heacox, as we bid “A Final Farewell To Hollywood Park.” We will share these photos on our Facebook and Twitter pages and, when the project is complete, an album dedicated to Hollywood Park’s memory will be permanently located on our Facebook page. “Life is a series of hellos and goodbyes; I’m afraid it’s time for goodbye again,” Billy Joel laments in his classic song “Say Goodbye To Hollywood.” For those of us who live and love California racing, those lyrics become all too real today. Every day for the next month, from October 2 through November 2, we will update our homepage with a different photograph depicting the daily activities at Santa Anita Park, the historic Southern California racetrack which is gearing up to host the 30th annual edition of horse racing’s richest annual event in North America — the 14-race, $25 million Breeders’ Cup World Championships — on Friday, November 1 and Saturday, November 2. Thanks to our good friend, photographer Marcie Heacox, Thoroughbred Info is the only media platform that will offer a daily visual diary of the pre-Breeders’ Cup activities at Santa Anita for a full month leading up to the big event. Marcie will be on site every morning with her cameras in tow, and we will select one image each day to be published. These behind-the-scenes photos may include the thrilling, timed works of prominent Breeders’ Cup contenders, quiet scenes from the barn area, insider-only snapshots of horses schooling in the paddock or intimate glimpses of jockeys, trainers and handlers as they meticulously prepare their runners for the lucrative Breeders’ Cup races. We cannot predict what adventures each day will bring for the next month, but we do know one thing for sure: Marcie will be there as a skilled, experienced photojournalist to capture it all for us — and for you. To view the “2013 Breeders’ Cup At Santa Anita Photo of the Day” feature, simply visit our homepage and either click on the current date under “The Latest Showcase News” or scroll down the homepage. We will also post the photos each day on our Facebook and Twitter pages. Please feel free to comment and share these images via social media with current and potential horse racing fans. We hope you all enjoy this exclusive, monthlong Thoroughbred Info feature! Kudos to the organizing committee for finally hosting this event at an active racetrack, rather than in a generic hotel ballroom. Let’s hope Santa Anita Park will get the opportunity to do the same in 2014. Todd Pletcher’s exciting colt, who kept his undefeated record intact with a gutsy Breeders’ Cup Juvenile (G1) win, is the hands-down choice in this category. A narrow decision between the top two, but two wins by Executiveprivilege over her talented rival is just enough for her to secure my vote. I will never understand why the Eclipse Award finalists for this category always seem to be just the sophomores who perform well in the three Triple Crown races. Instead, the whole year’s body of work should be considered. For 2012, that means the major Grade 1 victories over their elders by Pacific Classic (G1) winner Dullahan and Breeders’ Cup Sprint (G1) winner Trinniberg deserve to be recognized. Why is My Miss Aurelia a finalist this year? She won a single Grade 1 race in 2012, beating Questing by a head when receiving seven pounds from her. In contrast, the 3-year-old fillies Questing, Contested and Lady of Shamrock each won a pair of Grade 1 races during the year. If the gamble to run in Santa Anita’s La Brea Stakes (G1) in the final days of December had paid off with a victory for My Miss Aurelia, rather than a lackluster third to Book Review (whom Questing had defeated earlier in the year), she would have challenged Questing for my top vote. Because this Eclipse Award is not engraved with the word “dirt” etched on it, the three-time Grade 1 winners Wise Dan and Little Mike deserve top billing over Breeders’ Cup Classic (G1) upset winner Fort Larned. Royal Delta’s overwhelming triumph against a good field in the 2012 Breeders’ Cup Ladies’ Classic (G1) was a visual treat, and marked her second consecutive win in this important year-end race. I’m proud to cast a championship vote for her again this year. This division fell apart in 2012, but the well-traveled Trinniberg (eight starts at eight different tracks) earned his top spot. Five graded tallies at legitimate sprint distances, including three in Grade 1 company, make Groupie Doll a clear stand-out here. In any other year, Little Mike and/or Point of Entry would have deserved this honor. But Wise Dan’s track record-setting effort in the Breeders’ Cup Mile (G1) trumps his peers’ admirable records of three Grade 1 grass wins each in 2012, which Wise Dan also accomplished. Sadly, this division has not been the same since Bobby Frankel died in 2009. His Juddmonte colorbearers were always contenders. Congratulations, however, to this year’s winner. Dale Romans had a breakout year with nine Grade 1 wins, including the Arlington Million, Breeders’ Cup Turf, Met Mile and Pacific Classic. Plus, he made a real effort to reach out to new and existing racing fans through social media and an informal meet-and-greet with his stable stars prior to the Breeders’ Cup at Santa Anita. A class act. For the second consecutive year, Ramon Dominguez ranked first among all North American jockeys by earnings and second among all North American jockeys by wins. My vote for Ms. Napravnik is in recognition of her groundbreaking wins in the Kentucky Oaks (G1) and Breeders’ Cup Juvenile, and her record placement on the year-end earnings list. By sheer numbers alone as the leader by wins and earnings in North America, Midwest made this no contest. Congratulations to international powerhouse Darley, who bred five different North American Grade 1 winners of 2012. Just one loss (a second-place finish) between them in 15 combined starts during 2012, all but two which came in graded stakes company. Except for the abbreviated season by I’ll Have Another, this is the way it should be every year when it comes to the top award. Win A Piece Of Racing History In Our 2012 California Freshman Sire Contest! Since the Eclipse Awards were established in 1971, only 36 Thoroughbreds have been selected to receive the high honor of being named Champion Older Male. The list of award recipients includes racing legends such as Forego, John Henry, Ack Ack, Seattle Slew and Cigar. Four months ago, California-bred Acclamation added his name to this illustrious group when he was voted 2011 Eclipse Champion Older Male, based on the strength of his 5-year-old campaign, which elevated his career earnings to $1,628,048. Featured among his five consecutive graded stakes victories in Southern California last year were two Grade 1 wins on turf and a successful switch to Polytrack in the $1 million Pacific Classic Stakes (G1). The Old English Rancho homebred by leading California stallion Unusual Heat also received recognition as the 2011 California Horse of the Year, Champion Older Male and Champion Turf Horse. In celebration of Acclamation’s remarkable achievements, we are thrilled to offer a very special piece of racing memorabilia to the Grand Prize winner of our 2012 Don Engel Memorial California Freshman Sire Contest: a handsome leather halter worn by the Eclipse champion, and engraved with his name on the brass cheek plate. This extremely rare item was generously donated to Thoroughbred Information Agency (TIA) by Acclamation’s owners, Bud and Judy Johnston and Peter and Mary Hilvers, and trainer, Don Warren. 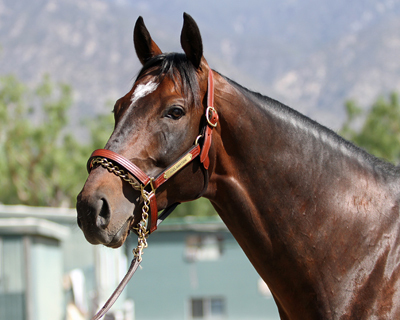 Our 2012 Grand Prize winner will also receive a beautiful photo of Acclamation wearing the halter by photographer Marcie Heacox, a one-year subscription to the award-winning “California Thoroughbred” magazine (donated by California Thoroughbred Breeders Association) and a $250 cash prize from us at TIA! Our Second-Place Prize winner will receive a copy of the recently published book “The Hill: 30 Years of Photographing Santa Anita’s Unique Downhill Turf Course,” featuring more than 100 pages of amazing images shot by the renowned photographer Katey Barrett. 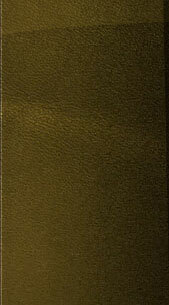 This hard-cover edition, which retails for $85, has been autographed by the author. Our Third-Place Prize this year is also a fantastic racing collectible: a copy of the January 21, 2012 issue of “The Blood-Horse” magazine, announcing the mare Havre de Grace as the 2011 Eclipse Horse of the Year and autographed by her regular jockey, Eclipse Award winner Ramon Dominguez. Participation in our 2012 California Freshman Sire Contest is absolutely free! We invite you to enter, and try your hand at predicting the year-end rankings of California’s newest group of first-crop stallions. It is a very competitive group of eligible stallions this year, so we are looking forward to hosting a fun contest and tallying some dynamic results. Entries are due by 11:59 p.m. (Pacific) on Thursday, May 10, 2012. Thank you for participating, and good luck! TIA’s 2012 Don Engel Memorial California Freshman Sire Contest! is the top prize in our 2012 California Freshman Sire Contest! Congratulations To Our 2011 California Freshman Sire Contest Winners! Congratulations to Ray Hurley, the Grand Prize winner of our 2011 Don Engel Memorial California Freshman Sire Contest! In terms of quality and drama, it was a pretty quiet year among the California-based first-crop sires; only four of the seven active stallions in this category achieved a winner from their first crop of 2-year-olds in 2011. Although his total progeny earnings were $287,862 — more than four times the purse money accrued by his closest rival and enough to give him a clear victory in the race for the statewide title, California leader Awesome Gambler ranked just 30th among all North American stallions whose oldest runners became eligible to race in 2011. The battle for our contest prizes was much closer in the end. From our record number of contest participants, who submitted their entries from 20 different states, 27 players correctly predicted that Awesome Gambler would conclude the year on top in California. Of these 27, however, only two participants correctly guessed four of the top five eligible California freshman sires in exact order, based on year-end progeny results as compiled by “Blood-Horse.” Ray Hurley and Maricela Salmeron of California each submitted their top four entries of Awesome Gambler, Don’tsellmeshort, Awesome Spirit and Under Caution, allotting each of them 32 contest points, but Ray’s tie-breaker prediction of $275,000 in total progeny earnings for California’s leading freshman sire gave him the victory in the end. Curt Larson of California correctly predicted the top three sires, earning 30 points and our Third-Place Prize. The top five California first-crop stallions of 2011 were Awesome Gambler, Don’tsellmeshort, Awesome Spirit, Under Caution and July Child; the deceased Jet West was not eligible for contest purposes. In addition to receiving $250 from Thoroughbred Information Agency as our Grand Prize winner, Ray is the new owner of a rare piece of racing memorabilia: an engraved leather halter worn by the 2010 California Horse of the Year and Eclipse Award finalist Evening Jewel. Ray will also receive other Evening Jewel mementos, as well as a free one-year subscription to “California Thoroughbred” magazine as part of his Grand Prize package. One 16" x 20" Jaime Corum print entitled “Racing Royalty,” commemorating Zenyatta as the inaugural winner of the Vox Populi (Voice of the People) Award and featuring the 2010 Eclipse Horse of the Year alongside the 1972-1973 Eclipse Horse of the Year, Secretariat. This print has been signed by the connections of Secretariat (owner Penny Chenery and her daughter, author Kate Chenery Tweedy) and the connections of Zenyatta (owners Jerry and Ann Moss, trainer John Shirreffs and racing manager Dottie Ingordo-Shirreffs). 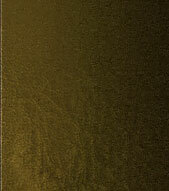 One copy of the hard-cover book “Sham: Great Was Second Best,” published in 2010 and signed by author Phil Dandrea. This unique copy has also been signed by Racing Hall of Fame jockey Laffit Pincay Jr., who rode Sham to victory in the 1973 Santa Anita Derby (G1) and partnered with the colt throughout the memorable Triple Crown races that year: the Kentucky Derby (G1), Preakness Stakes (G1) and Belmont Stakes (G1). Thank you to everyone who participated in our 2011 contest. We will announce the details of our 2012 contest later this spring, and we hope you’ll decide to play again! Now, where was I??? Oh yes, I remember. Here are my choices for the 2011 Eclipse Awards, as submitted on my official voting ballot as a member of the National Turf Writers and Broadcasters. Congratulations to this year’s winners. Now, let’s all hope for a more exciting year of racing ahead. This precocious trio of Grade 1 winners rounded out the Breeders’ Cup Juvenile (G1) trifecta, as well as my ballot. As in the young male division, the 2011 Breeders’ Cup Juvenile Fillies (G1) was quite formful, with the top three finishers ultimately deserving the end-of-season nods. Because this was such a wide-open category last year, with no clear standout, I decided to give my votes to each of the three sophomore males who managed to win a Grade 1 race against older horses in 2011. The exquisite Royal Delta was dominant in her division, and bolstered my belief that Juddmonte Farms sold her U.S.-based sire, Empire Maker, to Japan far too prematurely in 2010. Acclamation won three consecutive Grade 1 races on two different surfaces during 2011, including a game victory against a quality Pacific Classic Stakes (G1) field. Toss in a pair of Grade 2 wins for added measure, and no other older horse in North America even came close to this California-bred’s body of accomplishments last year. Her three Grade 1 wins recorded in 2011 make this category a slam-dunk for Havre de Grace. California speed ruled this division, in which I limited my voting considerations to only those races conducted at distances of less than a mile. This was a salty division in 2011, headed by Hilda’s Passion and her four graded stakes wins at a combined margin of more than 22 lengths. Cape Blanco’s three Grade 1 grass wins last year trump Acclamation’s two. It’s too bad we did not get to see these fine warriors meet head-to-head. Although this was not a very inspiring division in 2011, these three Grade 1 winners stood out from the rest. John Sherriffs accomplished it in 2009 and earned my vote back then, so Bill Mott rightfully deserves it this year for doing the same: bagging the rare Breeders’ Cup Classic (G1)/Breeders’ Cup Distaff (G1) (nope, still refuse to call it the Ladies’ Classic) daily double. Mott also saddled 2011 Cigar Mile Handicap (G1) winner To Honor and Serve, who I think is the most talented American horse currently in training. Ramon Dominguez ranked first among all North American jockeys by earnings and second among all North American jockeys by wins in 2011. Well done! I usually abstain from voting in this category, but this year I actually took the time to analyze the contenders and submitted the top three on my original ballot. But when it was subsequently announced that the statistics that had been printed in the voting guide were incorrect, I frustratingly decided not to waste my time re-analyzing the new numbers, which means I ended up with a non-vote again this year. All three of these ownership groups enjoyed stellar seasons in their own right, but my vote went to Fox Hill Farms for their sporting gesture of running Havre de Grace against males in the Breeders’ Cup Classic, then announcing afterward that she would return to racing in 2012, rather than retiring to broodmare duties. No one epitomized Thoroughbred breeding more than the Ramseys in 2011, when they ranked second among all North American breeders by year-end earnings and tallied eight graded stakes wins as breeders, primarily with runners sired by their homebred Grade 1 winner Kitten’s Joy. Although Havre de Grace is almost certain to receive the Horse of the Year trophy on Monday night, becoming the third consecutive female racehorse to receive racing’s highest annual honor, my ever-so-slight choice is Acclamation for his fun string of five consecutive graded stakes victories on two different surfaces. Hey, if the East Coast can have a voting bias every year, the West Coast can too. 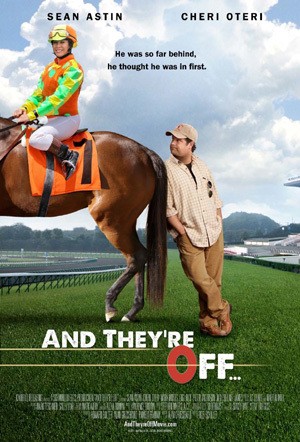 Last weekend, I had the opportunity to attend the Hollywood premiere of the new film “And They’re Off…,” a funny, sweet look at the emotionally charged world of horse racing and the offbeat characters that are often drawn to it. Cleverly filmed as a mockumentary, the movie is similar in its style and its dry humor to the popular comedies “This is Spinal Tap” and “Best in Show,” the former a legendary look at the not-so-glamorous-after-all lifestyle of rock-and-roll musicians and the latter a sharp skewer of the competitive dog show industry. If you liked either of these earlier films, “And They’re Off…” is squarely in your wheelhouse. The movie centers around the fictional character Dusty Sanders, a down-on-his-luck Thoroughbred trainer played by the always affable Sean Astin (“The Lord of the Rings,” “Rudy,” “The Goonies”). Dusty is a horse lover and tender soul who was born into the industry: he was named after 1970 Kentucky Derby winner Dust Commander by his father, Ken, a former horse van driver played to perfection by the droll Martin Mull (“Clue,” “Roseanne,” “Mr. Mom”). But times are tough these days; Dusty’s win percentage and client roster are both running low. Thanks to a lucky meeting at his high school reunion, Dusty finds himself back in the game with a mostly optimistic crew of eccentric new owners who send him their first racehorse with wide-eyed dreams of winning “the big one.” And that’s where this movie really works its charm. Instead of far-fetched notions of winning the Kentucky Derby or even one of the lucrative Breeders’ Cup races, Dusty and crew settle their sights on a minor stakes race on the Northern California fair circuit, proving on the screen what those of us in the horse racing industry already know to be true: that the thrill of watching your horse give his or her all for you while carrying your silks (however comically designed they may be) is a richly rewarding experience at any level. The film’s supporting cast is stellar, with standout performances by “Saturday Night Live” alumnus Cheri Oteri as Dusty’s scrappy ex-girlfriend-slash-jockey Dee Johanssen, Gigi Rice (“Frasier”) as the surgically enhanced horse owner Keri Wannamaker-Flamm and Mo Collins (“MADtv”) as the reluctant—and highly strung—horse owner Tina McKay. Southern California racing fans will enjoy cameos by trainers Bob Baffert, Doug O’Neill and John Sadler, jockeys Joe Talamo and Martin Garcia, television personalities Ken Rudulph, Simon Bray and Millie Ball and voiceover work by track announcer Vic Stauffer, as well as a special dedication at the beginning of the film to our own leading lady, the 2010 Horse of the Year Zenyatta. Hollywood Park, Fairplex Park and the barns at the Barretts sales grounds in Pomona are featured settings in the movie, lending to its local charm. Throughout the film, great care is taken by writer/producer Alan Grossbard (“Zerophilia”) to present Thoroughbred racing in a positive light, and to inject the film with authenticity and heart. Grossbard, a horse owner for the past decade, thankfully gets all the racetrack lingo correct, and allows non-racing audience members to learn more about our sport in easy-to-digest bits. In the comic canvas created by Grossbard and director Rob Schiller (“The King of Queens”), Thoroughbred racing is a quirky, interesting industry that is inviting to sheikhs and shoe salesmen alike. If I had to find one complaint about this movie, it would be the fictional name of its four-legged star, Caveat. Racing fans will easily recognize this as the name of the real winner of the 1983 Belmont Stakes (G1), himself a notable sire. But the horse’s name does pay off with a funny line near the end of the movie, so I’ll let this one slide. The movie gets bonus points, however, for its refreshing and family-friendly lack of vulgarity; in fact, I’m not sure I heard even one swear word in the script. So perhaps that is the movie’s second fault, because I can’t remember ever going to the racetrack in real life without hearing at least one F-bomb fly. “And They’re Off…” opens in limited release today in the Los Angeles area, as well as in New York, New Jersey and Kentucky. A wider release is in the works, and will be more likely with good attendance figures from its select opening. For more information, you can visit the movie’s official website. Good luck, Alan and crew! Five years ago today, I lost a friend of mine. Earlier this month, I lost her again. Her name was Debra Ginsburg — Debie, to her many friends —and she was an 18-year cancer survivor who ultimately succumbed to the disease on June 30, 2006 at the age of 51. For more than 20 years, she covered the breeding and racing industry as the chief writer for California Thoroughbred magazine, a pleasant, hard-working sort who never missed a deadline or the opportunity to share a laugh with someone. Soon after she died, Debie was memorialized in a unique way when an unraced, 2-year-old filly was named in her honor. The filly had been born the same month as Zenyatta, in April 2004. Although she did not make the same impact on the sport as that all-time great ultimately did, she did attain a loyal group of fans who followed her every move and enjoyed personal visits with the horse who was named after their lost friend and family member. 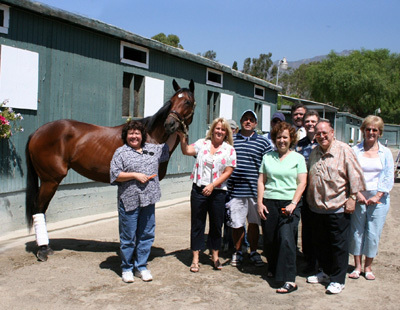 About 30 of us showed up at Santa Anita Park on January 27, 2007 for Debie Ginsburg’s racing debut. She was entered in a 6 1/2-furlong maiden special weight race, appropriately scheduled on the undercard of the Sunshine Millions program which Debie had so diligently covered in the past. But unlike her California-bred namesake, who was born in Fresno, the filly had been foaled in the rival state of Florida. Debie would have laughed at the irony. We were all there just for the bonding experience, never expecting a miracle to happen as the nervous young filly pranced from the saddling barn, then reared with uncertainty when jockey David Flores put his foot in the iron. “She would make a beautiful show pony,” I mentioned to Debie’s mom, Myrna, as we watched from inside the same walking ring where I had last seen Debie the previous March, prior to Lava Man’s first Santa Anita Handicap (G1) victory. Turns out, her mom was right. Debie defied the odds that day, winning her debut by a fast-closing neck at 11-1, even after making the rookie mistake of turning to face us all in the stretch as we roared her name from the rail. Our tears flowed openly onto clothes which were already dampened by a sudden misting of rain. A maiden no longer, Debie proudly stepped into the winner’s circle, where she was greeted by an emotionally spent crowd of well-wishers. Her parents were interviewed on-air by an HRTV reporter. I later wrote about the experience for Thoroughbred Times. Other publications picked up the heartwarming story as well. Her future was bright, we all thought. This one is special. We’ll enjoy watching her racing career, then look forward to her life as a broodmare. Our Debie had died childless; how fun it would be to see this filly’s foals carry her name forward in Thoroughbred pedigrees for generations to come. But that was not meant to be. Debie Ginsburg was lost in a claiming race at Santa Anita just a year later, then whisked away to Canada by her new connections. Some of Debie’s friends kept in touch with her new owners, who became well aware of the story behind this certain filly. The offer was continuously made: if she ever reached the end of her days as a racehorse, we’ll gladly scrape together the funds to bring her back home to California for a well-deserved retirement. For the next three years, Debie raced in modest centers such as Stampede Park, Penn National and Northlands Park, passing through a few different barns while racking up four stakes placings and an overall bankroll of $186,952, enough to become one of the top earners for her sire, Delaware Township. She won four races and placed in 19 others, and had made a gallant late move for second in her 40th lifetime start on June 1 this year when one of her front legs suddenly snapped during the gallop-out of a $20,000 claiming race at Northlands Park. Debie was destroyed that night for humane reasons, we were told by email, along with the last remaining dreams of her devoted followers. The timing was terrible. Since Debie had been toiling away in claiming races, winless at the age of 7, a few of us in her early inner circle had hoped we finally might have a chance to guarantee her future as a broodmare, and to possibly name some of those foals we all thought she was destined to have. It was a bittersweet ride in a game that is too often punctuated by cruel fate. If there is a lesson to be learned, perhaps it is that owners should be cautious and think twice before they name a horse after someone, unless they are planning to secure that horse’s future long after the headlines have faded. Although it was certainly a well-meaning gesture at the time, Debie Ginsburg’s loved ones are now left behind to mourn not just once, but twice, for two connected souls that were tragically lost. visit her namesake at Santa Anita Park in 2006. Photo courtesy California Thoroughbred Breeders Association.